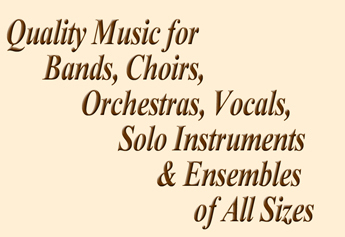 Balancing audience-pleasing accessibility with fresh, exciting music that challenges and inspires players to exceed their own limits, Sound Studio Publications offers uniquely creative, impeccably edited scores and parts that help performers share the joy of making music. Our mission is to enable you, your ensemble and your audience to be in perfect harmony with each other through our inspired musical works, attention to detail and extraordinary customer service. To order using check or money order CLICK HERE for Band & Orchestra printable order form. To order using check or money order CLICK HERE for Jazz & Small Ensemble printable order form. Schools/Organizations using purchase orders send an email via the Contact page. All shipping costs shown for each individual item are for delivery in the United States only. to determine shipping costs before placing your order. THANK YOU!! Please email us if you have any trouble with online ordering. All orders are final - no returns. hear MP3 excerpts and see PDF sample pages. © 2019 Sound Studio Publications. All rights reserved.